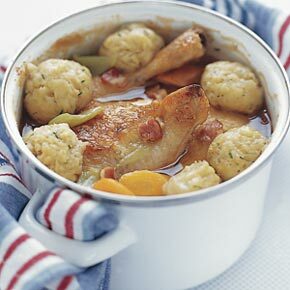 This is an incredibly easy chicken stew recipe that I somehow aquired from a Great British supermarket some years back. I like it especially on those lazy days when everything just seems like too much work. Some of the ingredients listed below are easily forgotten or replaced if you don't have them. Feel free to use this recipe as a base and then add whatever you want and make it your stew! But don't forget to let us know what you did to change the recipe! You will also need about 12 small dumplings. You can either buy them or follow this link for a great dumplings recipe. Gently fry the chicken thighs for a couple of minutes just so they are brownish all over. Put the chicken into pan with some oil and then add the bacon, carrots and leek. Cook gently for a few minutes and then add the chicken stock and water. Add the bay leaf. Bringt the pan to the boil and then shove it in the oven at 160 C for about half an hour. This should give you time to make (or buy) the dumplings. Add the dunmplings and then cook for another 30 minutes or untill the chicken is nice and soft.